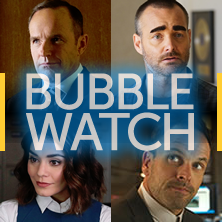 At this time last year, there were fewer than 40 broadcast shows still on the bubble. This year? Nearly 70. While The CW has given early pickups to nearly every one of its shows, the other four networks have renewed only a select few, leaving the fates of many series up in the air with less than two months to go before the networks make their 2017-18 schedule announcements. To determine which of those shows look safe, and which are in danger of cancellation, we have surveyed a variety of experts. Below, browse the resulting renew/cancel odds for over 60 scripted shows still on the bubble (listed in alphabetical order).